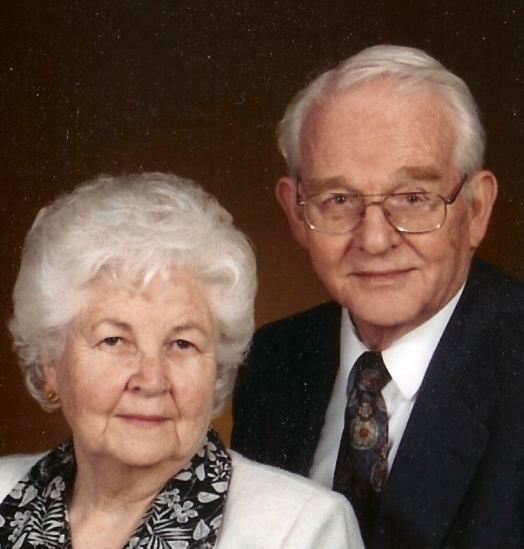 When the war ended in 1945, Doris and I were married, and I finished my studies at Purdue with a BS in Electrical Engineering on the GI-Bill, while Doris worked on the campus as a secretary in the Agriculture Dept. The Lord blessed our union with four children, two girls, Judy and Rebecca, and two boys, David and Jeffrey. David went to be with the Lord at 19 years of age while a student at Cedarville College (1972). We have been blessed with 10 grandchildren and five great-grandchildren so far. After working for Illinois Bell Telephone Co. for six years as a mobile radio engineer, the Lord clearly made it known to us that He wanted us in His service (that's a long story in itself). So we moved to Los Angeles, CA, in 1953, where I attended Los Angeles Baptist Theological Seminary (now Northwest Baptist Seminary in Seatle, WA), graduating with a MDiv. degree in 1957. During those years I continued working as an engineer. From there we moved to the Philadelphia area where I attended Dropsie College for Hebrew and Cognate Languages, graduating in 1969 with a Ph.D. in Hebrew and Cognate Studies. My dissertation topic was "The Development of a Theoretical Basis for Machine Aids for Translation from Hebrew to English." During that time, I continued working as an engineer, ending up as a Sr. Research Engineer in the optics and electronics laboratory of the Franklin Institute Research Laboratories in Philadelphia; in the process, I learned computer programming and used it as part of my job. Upon graduation, the US Department of Education funded a two-year research project that enabled me to first implement computer aids for translating from Modern Hebrew to English. When that project was finished, the Lord led us to Temple Baptist Seminary in 1972 where I taught Hebrew and OT subjects until my retirement in 2005. From the time that I began teaching Hebrew, I have taught it based on a theoretical linguistic model rather than by the classical approach. I have written a second-year grammar of Hebrew syntax and exegesis based on that model and hope to have it published in the near future. While teaching at TBS, I had the privilege of serving as the Executive Editor of the NKJV Old Testament, and as the Chairman of the Executive Review Committee of that translation. In addition, I had the privilege of serving as a Section Editor (historical books) for the Holman Christian Standard Bible, and translator of 2 Chronicles. Since retiring, my time has been devoted to research and writing the results of which are found elsewhere in this site.